To say that here at WHOAS we are upset with the AEP and government opposition to the wild horses is putting it mildly. A couple of weeks ago we stepped in to rescue a whole herd of 11 wild horses, including two foals, that were trapped on some private land. It was no fault of the horses that they ended up here. They normally inhabited an area just inside the forestry within a half a mile of roadway gates that lead further back. They had been there for some time without causing any harm. Then one day we noticed that someone had swung wide open the barbed wired gate that leads out onto the public roadways. Accident? Don’t think so. Soon after we were notified of this herd of horses being where they were. Is it a coincidence that the forestry land that they had lived on for so long is also a cattle lease for the people that own the private land where they horses ended up? Don’t think so. This is just speculation but it seems odd that this happened right after the cattle were put onto this lease. With threats of them being sold to a meat buyer, WHOAS stepped in to save them having to purchase them off the land owner. We have rescued so many horses over the years and found loving homes for all of them. The one thing we have found out though is that mature horses, such as the stallion and four mares in this herd, are very difficult to gentle and to find people who wish to adopt them. They never totally lose their want to be free. The younger wild horses are much easier to work with and make excellent human companions to their adopters. Once at our handling facility, we separated the horses to ensure their safety and began to feed them and try to have them settle down and gain some trust in us. 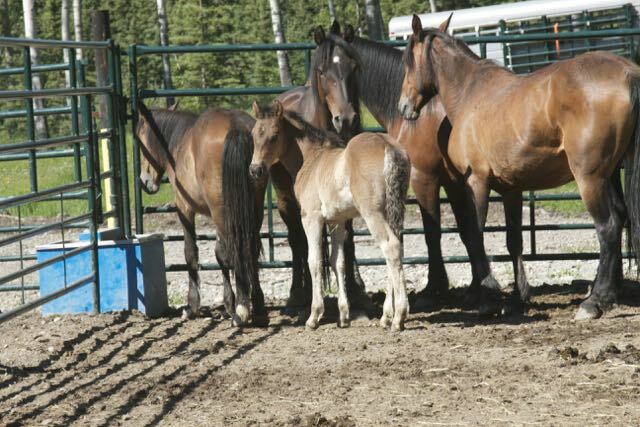 As you are likely aware, the new foals cannot be weaned from their mares for several months. Knowing all the difficulty it is to gentle the adults, we proposed to the AEP a plan to relocate the five mature horses and also the two babies. What we proposed was that we would brand all of the adults so that they could be identified in the field for future research. We offered to also vaccinate the mares to prevent them from reproducing thus helping with population management that the AEP has indicated they want so badly. 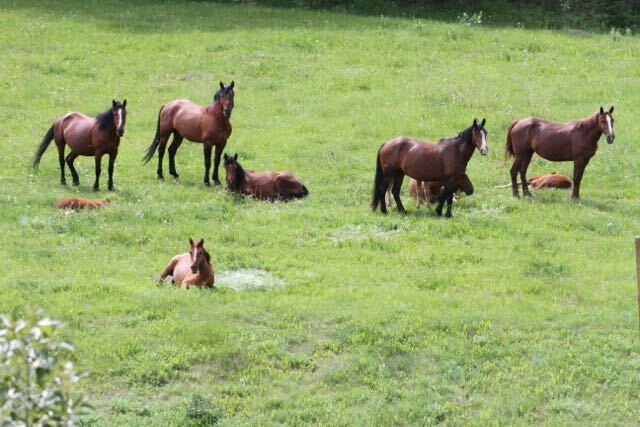 The two yearlings and 2 two-year olds we would keep and get them ready for adoption. In all this would have had an effect by taking seven female horses out of the reproduction cycle which would have been a great benefit to a possible AEP management strategy. We also pointed out to them that we could have had the U of S collar one of the mares for tracking purposes. This would have given a lot of information to the AEP on herd movements throughout the range and through the seasons. This kind of information is vital in determining any sort of management program. This collaboration would have been a “win-win” for all parties involved, but especially for the horses. The response today was that the AEP has denied this plan! They say that since we bought the horses off the land owner, they belong to us and they cannot allow us to put them back on public land. They indicated that this is a legality issue. 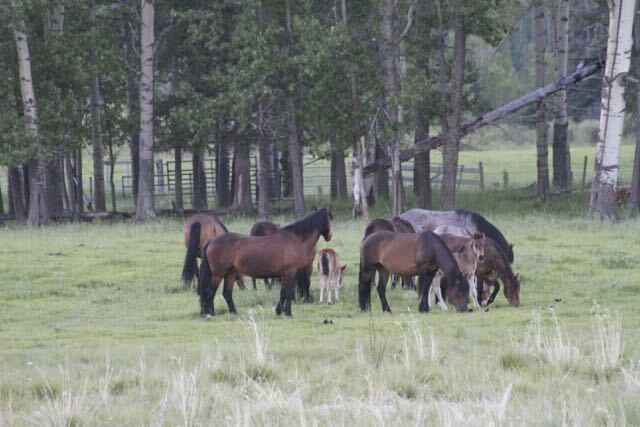 This is even though how the horses got off public land and ended up on private property is quite suspicious. This negative attitude toward the horses by the AEP is constantly displayed in all our dealings with them. Considering one of the policy makers in the AEP is a cattle rancher, I guess this is not surprising. Time to take action – contact the government to express your views and concerns. 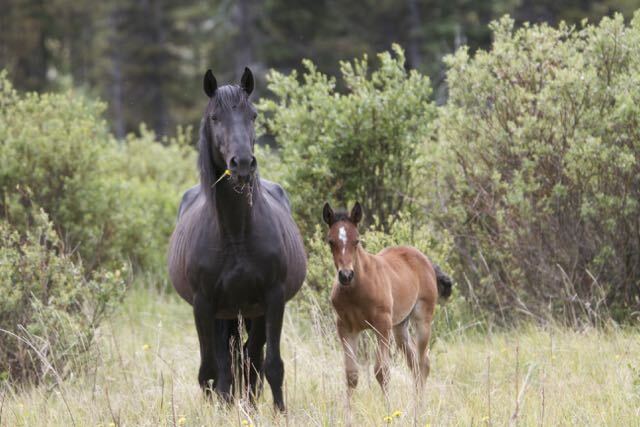 WHOAS will always continue to work toward solutions that will enable our Alberta wild horses to forever remain roaming wild on public land in the foothills. It’s sad you were unable to purchase their freedom alone. Why such a stigma against the horses? A small country like Great Britain has so many parks and manages large herds of feral ponies. Even a spit of land as small as Sable Island has a significant herd. Alberta is huge with great tracts of PUBLIC lands. It is really unfortunate that there are clowns out there like that rancher that do not see compassion, only greed. And also trying to give us crap that the wild horses are eating all the grass where they graze their cattle. Wow, maybe we should eradicate all the deer, moose and elk too.